Applying for a research grant independent from a specific lab is another form. 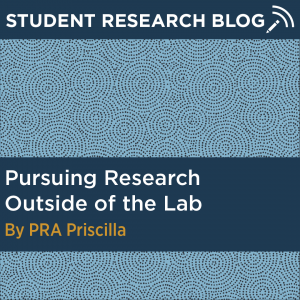 Through my experience, I have learned that this is a great way to follow your own research interests, which you can continue to pursue throughout your undergraduate career. Last year, I, along with three students from Neag School of Education, received a UConn IDEA Grant to design a peer tutoring program aimed at helping Emergent Bilingual students improve their language abilities. We worked with Windham High School to create a program that would address the needs and preferences of the students, which we learned through conducting interviews. My primary role in the group was monitoring the language acquisition of the students, and through this research project I was able to learn more about bilingual language acquisition. Throughout my education, my Spanish classes were my favorite because I loved the idea of learning and utilizing another language. I had always been interested in learning how our brains come to process a second language, so I was thrilled about the topic of this research project. Through my research, I was able to learn skills that I would not learn from my typical courses, such as maneuvering the IRB process, working on an interdisciplinary team, and communicating with school administration systems. I appreciated learning these skills, but my initial reasoning behind getting involved in undergraduate research was a desire to learn more about bilingual language acquisition, and that was the portion of research I wanted to continue. I was sad when my first research project came to an end because I had enjoyed the topic I was researching. As the project was in its ending stages, I had to begin developing a research topic for my Honors Thesis. My Thesis offered the perfect opportunity to continue research on bilingual language acquisition, and I am thrilled that I can continue building off of what I learned in my initial research project. My Thesis will be an extensive literature review on bilingual language acquisition of English-language speakers who are learning Spanish at the high school level. I will develop a theorized second language acquisition program for students of this group and I will adapt the framework of this program so it may be conducive to learning language in various settings and situations, such as speech and hearing clinics. In retrospect, I believe getting involved in research earlier in my undergraduate career enhanced my learning. For me, pursuing research outside of a specific lab on a topic I was interested in was a way for me to broaden my scope of learning. Through my courses, I learned about the topic of bilingual language acquisition, and through my research, I was able to deepen my understanding of the topic. My first research project allowed me to gain a deeper understanding of the topic, and my Thesis is granting me an opportunity to further develop and apply my knowledge. Priscilla is a senior majoring in Speech, Language, and Hearing Sciences and minoring in Spanish. Click here to learn more about Priscilla.